Steve Howe's first solo album (ah, so that's why it's called "Beginnings"!) dates from 1975 between the Yes albums "Relayer" and "Going for the one". At the time, all the band members were indulging themselves in solo projects, so "Beginnings" faces comparison with albums such as Chris Squire's "Fish out of water", Patrick Moraz "Story of !" and Jon Anderson's "Olias of Sunhillow". For me, Howe's first effort was something of a disappointment. While he calls in some heavyweight musicians including fellow Yes men Alan White, Bill Bruford and Patrick Moraz, he decides against outsourcing the vocals. Howe's voice works well when it used as a harmony to Jon Anderson's lead, but it does not sit well at front and centre stage. Unfortunately, on this album Howe is quite vocal, with over 50% of the tracks requiring him to sing. Howe also composes all the material with the exception of an adopted poem within the first track. Songs such as "Australia" are adequate, but without the minds of Yes as a group to develop them, they have a tendency to sound like they remain in demo format. Steve's guitar work is of course technically excellent, but for me it sounds dry and unexciting. To be fair, he does try to introduce some variety to the proceedings, with added brass on "Lost symphony" (which sounds anything but symphonic) and a small orchestra (whose parts were written by Patrick Moraz) on the instrumental title track. This pleasantly baroque piece is probably the highlight of the album. This and the following "Will o'' the whip" account for about a third of the album, the latter being a distinct improvement with an interestingly progressive structure. Moraz plays mellotron here, but it is a bit too far back in the mix, plus Howe is credited with Moog. While "Beginnings" might be hailed as a decent first album by a talented newcomer to the music scene, we have to bear in mind that Steve had been around for a while by the time of this release. Ultimately its principal message is that he is at his best when he is a part of a great band. 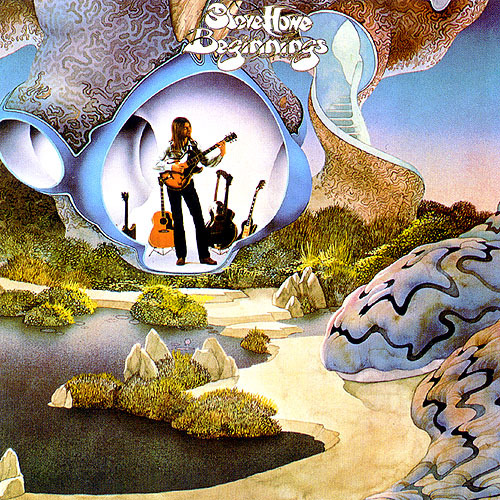 Howe had the presence of mind to ask Roger Dean to design the cover, but even here the fine illustration is marred by a rather clinical photo of Steve and his guitars.